We move through an enormous city of, according to the driver, 20 million people. It looks prosperous and proud. The hotel is very nice, elegant, and in a perfect location. The rooms are small, but what else can we expect from an old fashioned building in the middle of small city alleys? They even have a swimming pool and a health club. It is already 6 Pm by the time we settle in and wash up. We venture into the neighborhood and have dinner in an outdoor restaurant around the corner. A very nice place, the food is great. We see numerous young women in headscarves. These are clearly the expressions of fashion. The fashion this year is long hair piled up high on the head, which gives the scarf the kind of shape that I remember from the early sixties in Italian movies. There, the Italian beauties were wearing scarves like that while driving in convertible sport cars. I also remember imitating this fashion when I was in highschool in Poland. We all did. It is altogether too late, too much food, too much meat, too much everything for me. I barely make it to the room and drop into a heavy sleep at 10 PM while Philip is still stretching the day over coffee on the roof terrace of the hotel. The night is cool. Philip wakes me up at 9 AM. He has already had his breakfast. The breakfast buffet is incredible; far more food that I can contemplate. The hostess is very direct, something that I will quickly discover is a very Turkish thing: no much private space allowed among strangers. Seeing me over a modest bowl of yogurt, she stops over me and says “come on, don’t be so American, have some cheese, some real food, enjoy!” When I explain that my dinner last night was very large and heavy, she seems genuinely interested in the trivial topic of where we ate and what we ate. The first half of the day is for the main two sights: Aya Sophia and Blue Mosque. We get there by tramway (pronounced the same way as in Polish). These are very modern vehicles, moving fast and close to the sidewalks. We have to be careful not to be run over. We could only wish for public transportation system like this in Boston: trains follow each other in quick succession and are fast. It is hard to imagine what Istanbul would look like if all these people tried to move around in cars. Actually, I can: it would be what Bangkok was the last time I visited, in 1989. A complete standstill. The system of tickets is the same as we saw in Curitiba, Brazil: people buy tickets from a machine on the sidewalk, then go through a turnstile, so when the tramway comes to the stop people can embark very quickly. Again, we encounter the Turkish unceremonial involvement in the business of strangers. A man come up to Philip while he is buying a ticket, pulls the bank note from his hand, and starts buying tickets for us on the assumption that we do not know how to do it. I scan the faces on the tram and on the streets: I see no Asians, no blacks, no Arabic looking people, and no Central Asian features. Otherwise, there are all kinds of faces, not particularly beautiful or handsome. This could be Poland except for more dark hair people and women with large dark eyes. We see no traces of “Turkic” people from central Asia. Later, Nicholas tells us that this is special for Istanbul, where there are mostly Jews, Greeks and some other European descendants living. But the future proves him wrong because in Izmir we will find the same kinds of faces. People are friendly. My gaze meets that of two women with children standing on the sidewalk; they smile, then smile again while passing us by. Standing on the street with an open map is a sure thing that someone will come over to offer directions or otherwise assistance. And people say it with such simplicity and warmth. Blue Mosque is beautiful. Aya Sophia is a huge barn. The most interesting observation: effaced frescos of Byzantine saints, covered with crosses, then covered again with Islamic decorations. Not a very good cover job. We walk along the Golden Horn. The map shows that we are in Europe, but not far from here, along the Bosporus Strait is Asia. So amazing. On the way back we walk, looking at the storefronts. A rug shop has a woman making a rug. We spend considerable time watching here. Silk on silk is the Turkish type of a rug. No wool, apparently thr latter being a Persian style. We have lunch in a little garden restaurant Medusa, under fruit trees (apples and lemons). So perfect and not expensive. Get to the hotel at 3, take a shower and rest for a bit. At 4:30 we take off for the conference center at Bogazici University. First a tramway ride to the end of the line, then a half an hour taxi raid. Along the Bosporus much of the way, through this enormous city. Some fancy neighborhoods on the left with villas on steep hills and yachts parked in the water on the right side. The university is on the top of a hill. Splendid campus. I feel instantly at home: I could be anywhere in the world, and when I am on a campus of a university I feel at home. Register, then an opening lecture by some famous man. We do not know many people here, this is a professional society to which we do not belong. A thought provoking lecture. We meet Nicholas, Philip knows a few faces. A capella performance by students, then a long cocktail hour outside, with plenty of appetizers to substitute for dinner. A long conversation with Richard something or other, a Jewish former hippie from New York who lives in Chelsea. We have too many glasses of wine, and talk about the capitalism in the US, the system, money, and everything else. I join Philip’s conversation with the Leiden professor. It gets dark. We go back on a chartered bus. We get back to the hotel at 11 PM. What a great day! Today is the official first day of the conference. We skip the opening ceremonies, and set out from the hotel at 10 AM. We both did not sleep so well. The trip already seems familiar. The tramway stop is around the corner form the hotel, and we know where the taxis are at the end of its line. While we get ready to hail and upcoming taxi a man unexpectedly jumps in front of Philip and flags it down. I think that this is another rude New York-like scene, but not! He stopped the taxi to help us. This place is unreal, I think, while sitting down while the stranger holds the door for me. Today the taxi cab takes a different route, not along the water. We get to see other neighborhoods and for the first time a few high-rise buildings. The conference proceeds as conferences do. In this one, the papers are very uneven in quality and the discussion is not so intellectually deep. Maybe I have become so accustomed to small thematic workshops that I already forgot that large meetings, with many graduate students and a very wide range of topics are that way. I learn a few things, get some insights about human behavior, get to hear how these people talk about economic growth and degrowth, and that is all I can expect. We meet Clauss Renning from the old European crowd in technological innovation, and we discover shared interests in consumption and the rebound effect. He also updates me on what Ortwin Renn is doing. Philip puts much more energy into networking than I do. I do not feel the need to make new connections; just want to hear interesting ideas. The food is good, people are friendly, the campus is lovely, and the weather is perfect. But it is a long day: the sessions finally end at around 6:15 PM. At this point they hand us little bags with sandwiches and we walk down this enormous hill and along the water for about half an hour to the cruise boat that takes us on a trip on Bosporus. We are a large group for this boat, about 300 people, and it is crowded and noisy here. I try two conversations about economic growth and about environmentalism, but each time my companion turns out to be quite ideological in her views, surprisingly so, considering that this is an academic conference. After a while we discover that the lowest deck of the boat is the quietest, we settle there for the rest of the trip, while the two upper decks get more and more party-like, with some awful music in the background. It is really spectacular to see Istanbul in the last rays of the sun. It is such a splendid sight. Philip and I are reflecting on the strategic position of this city, with one shore in Asia and another on Europe, the only way out for the Russian fleet in Black Sea. We pass stately palaces and expensive homes on the water. People are out in large groups on this warm night, whole families strolling, talking, taking refreshments. We decide to skip the conference today. Go to the Great Bazaar. Just as I expected of a Middle Eastern Bazaar. Reminds me of Old Jerusalem, but much much bigger and more prosperous. Modern shops in an ancient setting. Tons of jewelry, all 22 karat gold with its unmistakable deep yellowishness. Endless leader shops for tourists. We stop in one, try a couple of jackets, enough for me to realize that I do not want any of that stuff, that there is nothing unusual in it to stir a desire to possess it. Just another leather jacket made of very soft leather. But these men are very clever in reading their customers. Just as we are ready to leave, the owner sends his “cousin” who offers to show us something different. We follow him to a very upscale shop, narrow and high, with a circular staircase to the upper level. I quickly thumb through the densely populated racks of garments, the young man shows me two or three items, which fail to spark my interest. He knows that I do not need anything. So this clever merchant comes up with something different: a jacket made of leather so thin that it feels like silk. I have never touched anything like that. Very soon, I am trying on these marvels, and fall in love with one. It is dark blue, short and fitting, good for indoors, would go with jeans and with a silk dress, and it has a shimmering silver lining and a hood, also silver lined. Yes, very thin silver fabric, shimmering. The sleeves are very long and narrow, and when I roll them to my proper length I produce silver cufflinks. It is beautiful and with this silver hood it is totally useless for my professional life. Only for social life. I must look really taken with it, because the man makes the move toward Philip, with a totally ridiculous price of over $2000. I am just as glad to take a woman’s role in this proceedings: do not participate but only try another jacket in the same series, without a hood but not as well cut or fitting. Watch other customers. In the meantime, we are sipping Chai, talking about this and that. I like this man, and I like most of all to follow the negotiations between the two men. In a short time the price comes down to less than a half of the initial offer, still ridiculously high. I want to own this beautiful thing, but my head is spinning: I really do not have any idea what it is “worth”. So we walk out. Our plan is to figure out our own price and return. But we never do. All I have is the memory of this jacket and a vague longing for it. It really was beautiful. We continue in the bazaar, have another Turkish coffee, let the hours dribble away. We sit, we walk, we touch things, watch people, talk, repeat the cycle. This is a cool day, otherwise this could get very tiring. After lunch in an outdoor café outside the bazaar we spend the rest of the afternoon at the Archeological Museum. It is several buildings around a large yard, right next to Topkapi Palace. Very few visitors here. The collection is overwhelmingly large, and we need to be selective. It is also disorganized, and its logic escapes us. But never mind. The incredible history of this region comes to life. Babylonians, Assyrians, Greeks, Romans, Byzantines, Ottomans. Hellenistic, Christian, Muslim cultures. The waves of history pass through this area. The Greek sculptures, seen so close up that I can run my hand over them (very few museum guards are here), are a perfection of human form. Especially the small statue, about my height, of Athena, with perfect toes, the pinkies of which are curled under in a most charming manner. I do not understand my own fascination with the Hellenic culture, especially its sculptures. Perhaps it is my fascination with the search for perfect beauty, my love for perfect symmetry. I do not know. One day I will ask Anne Goble, who studies classics. One of the museum’s wonders is Alexander’s sarcophagus, which is preserved perfectly. Also, I am fascinated with an exposed mummy, with dried up organs on full display. I can identify the major organs as well . The museum is next to Topkapi Palace, on a terrace overlooking it. There is a café overlooking the Topkapi park where we take some tea. The most perfect moment when at 5:15 the call for a prayer is heard from many mosques all at once. It turns out that we are only a few minute walk from the hotel. The wall running along the tramway tracks, which we have passed every day on the way out of the hotel, are those of Topkapi Palace. How come we never noticed that wall before, of if we did, never wondered what it was? And what about the lovely red building on the corner? Never noticed it either. This is how it is with a new neighborhood: it becomes richer and richer in detail and meaning with time. Also, smaller. We experienced it in Budapest: the life of a little street corner becomes more intricate each time we pass it. I need to get from Netflix that movie about a street corner in Brooklyn; I believe the title is “Smoke” and the actor in it is Kival or Kivel, or something like that. An afternoon nap. A call to NY (busy all the time). Dinner at Medusa restaurant, under the apple tree, to the sound of live music. Walking home the long way around takes maybe 10-15 minutes: distances are getting shorter and shorter as we get to know the neighborhood. The traffic is calm at this hour, after 10 PM. A man sits on the curb playing a recorder. Two women buying pocket books from a street vendor. The outdoor cafes everywhere, half full and half empty. Istanbul is built on seven hills, steeply rising from the shores of Bosporus and Marmura Sea, with the Golden Horn sliver of water cutting into its center. The result is very picturesque, reminding me of Rio rather than S.F. For a city so dense with people and buildings, Istanbul has a lot of greenery. We have not come across parks in the European or US sense, but rather small patches of trees, vines climbing up and overhanging as canopies over some narrow streets, gardens spilling over high brick walls around buildings. It is impossible to describe the architecture of Istanbul. It is a mix of everything: pre-war European style buildings, post-war concrete ugliness from the 60s and 70s, Mediterranean style, barely thrown together third world buildings, some real or imitation Baroque or neoclassical 18th century style, and even occasional wooden structures precipitously leaning to one side or another. If there is a unifying theme, it is their consistent height of between 3 and 6 stories, and very nice store fronts. It somehow all fits together, I do not know why. Perhaps because the street level scene is interesting and there are few wide boulevards, which means that one rarely looks up or far ahead. It just feels right. And the city is full of stray cats. They are everywhere: in restaurants, shops, streets, at the conference, looking relatively well fed and clean. I have no idea who cares for these cats, but they obviously eat somewhere something. Today we skip the very first conference session. We get there after 10 AM. I find the sessions stimulating today. Over lunch I talk with a young man from Spain or Italy who ardently talks to me about the need to change the fundamental values underlying the assumptions, methods and tools of scientific analysis. We talk about Thomas Kuhn and how the paradigms shift in science. The last session of the conference is plenary, with a talk by a philosopher about well-being and happiness. He does not tell us anything we do not know, but he says it in a lively, colorful way, and I make myself good notes for my class on Sustainable Consumption and production. But as the others at this conference, he does not connect the dots of subjective well-being, consumption and the economy. We do not stay for the last minutes of questions. AT 5 PM we leave, walk down the steep hill of the campus and catch a taxi to go to the leather shop recommended by the hotel concierge. This is rush hour on Friday in Istanbul, and it is in every way a traffic nightmare. After an hour of watching the meter and of getting increasingly angry with myself for the totally unnecessary consumption behavior, the taxi driver lets us off near the mystery shop but in reality in the middle of nowhere, by the ferry pier. We cross highways, search for a direction, and end up in another taxi whose driver within minutes delivers us to the Shop. It is after six already, and we have an appointment with Nicholas at the hotel at 7:30. I am in a foul mood. But the store turns out to be a huge collection of the highest quality leader goods, what we call a factory outlet/wholesaler. It is clear that they were already closing down, but they turn the lights on again, serve us tea, and the shopping begins. Needless to say, I walk away with a very beautiful leader outdoor short coat that I do not need but love, and at a price well worth it. Much better deal that we could have gotten at the Grand Bazaar. These people have class and reputation to maintain: they send us home by taxi at their expense. We have dinner with Nicholas at our “favorite” Medusa garden restaurant. At ten to 9 a call for praying sounds through the city, as before magical. We linger at the restaurant for a long time, and get home close to midnight. I cannot fall asleep so I arrange two pillows in the bathtub and read a book late into the night. Today we walk and sightsee all day. Breakfast is late and large, we skip lunch. The first sight is right nearby: underground Yerebatan Cistern. This is a very large water reservoir built by Emperor Constantine in 4th century and later enlarged by Justinian. It is a huge place, deep underground, supported by Corinthian columns that connect the typical Roman arched ceilings. We realize that our Medusa restaurant and most of our immediate neighborhood sits on top of this cistern. Its size and sophistication blows my mind. The reservoir is full of fish. At the far end of the reservoir there are these two famous columns, the bases of which are heads of the mythological Medusa. One head is on its side, and the other is upside down, nobody knows why. The other exit from the Cistern brings us to Blue Mosque. Although we have been here before, today we discover a splendid courtyard which we missed last time. Like many such Islamic courtyards, this one is perfectly proportioned and tranquil. There is no doubt in my mind that symmetry has a calming and otherwise positive effect on the psyche. After a short break over ice coffee we turn toward a maze of small streets. We examine the typical Turkish lamps in one shop then another, but we do not buy them. Other small objects catch our attention. I buy a small cotton shirt for Calvin. And without quite realizing it, at some point we enter a local shopping district. Here, the streets are completely filled with people, from side to side, held in shape by walls of storefronts. We become absorbed by this enormous current of people. It is a human river, undulating, branching out into side streets, merging again from side streets. Moving, moving. There is no shoving, no pushing, no stepping over each other toes, just a relentless pulsating movement of people. Women in twos and threes are examining merchandise, talking. We see some tourists, but mostly locals. Canopies made of huge pieces of cloth hang over us, fastened to the buildings’ walls, so despite it being a middle of a hot day, it feels cool. There are little cafes in tiny alleys, sometimes under tree canopy, sometime under man made canopy. We let ourselves be carried on and on. It is an incredible feeling. 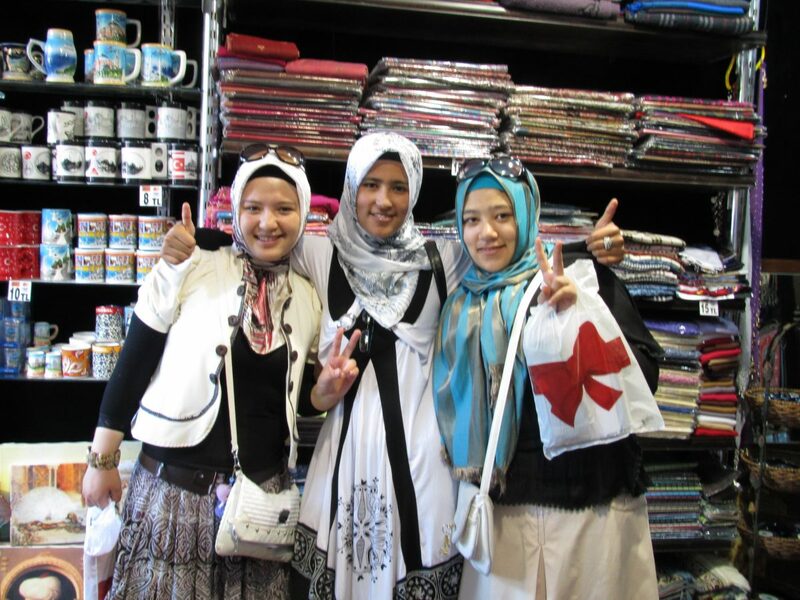 Women interest me the most, and I try to take pictures of young pretty women in headscarves. Many women have heavy eyebrows, like I used to have in my youth. There is cheap stuff to be had here: nice looking men cotton shirts for under $10. We do not need anything. Eventually, we find ourselves at what the guidebook calls Egyptian Spice market, which is an indoor bazaar for sweets, nuts and spices. More people, many aromas, we keep walking. At around 4 o’clock this human river finally deposits us near Galatal Bridge, exactly where we wanted to be. There is a mosque here, and we enter the courtyard. They have fosets here and small stools for washing feet. It is a very nice feeling to wash feet on this hot day, and after all this walking. We take a short rest inside the mosque, along with many other tourists and locals. It is quiet, tranquil, and totally informal here. Small children are chasing one another, men are praying in the main area (closed for tourists), women praying in a separate area fenced in by a latticed wall, just like in orthodox synagogues. The carpet absorbs sounds, our shoeless feet relax. This is a good rest. Galatal Bridge is a clever construction. The regular traffic of cars and people moves on the upper level, while the lower lever is a wide promenade of restaurants and strollers. This is an uninterrupted chain of restaurants specializing in fish. Overly touristy. We have an early dinner in one of them, enjoying the water breeze and watching the fishing lines hang from the fishermen standing on the upper level of the bridge. Our choice of the restaurant is not so great: the waiter is insolent and pushy, trying to get us to order much more food than we want and at high prices. It takes few sharp words to get rid of him. The fish we order is very fresh, but the meal is not particularly interesting. Tramway back to the hotel, a rest with a book on the roof terrace, then at 7:30 a performance of Sufi ancient dance, Dancing Dervishes, in the nearby Cultural Center. This is something new. The combination of this music and singing (which at times sounds exactly like synagogue chanting) and the spinning of the dancers has a hypnotic effect. At some point I feel incredibly sleepy, absolutely have to close my eyes, thought do not nap, and when the performance ends my mind feels as refreshed an clear as if though I had been meditating. A brief stop for Turkish tea (1 lira for two cups at a local alley, sitting on stools at these low tables covered with rugs), a stroll through streets full of restaurants and tourists, and we are home around 9 o’clock, the earliest of all the days so far. Touristing in a big city does not get better than that. Today’s big event is Topkapi palace. But before that we set out to see the Jewish Museum. It is located quite a distance from here, and we wonder around for quite some time after getting off the tramway before finally finding it at the very end of a tiny alley up the hill, almost at the foot of Galatal Tower. It is a small synagogue, no longer in use, perfectly rectangular charming building with enormous crystal chandeliers. There are other tourists here, perhaps a dozen or two, hardy Jewish souls paying homage to our tribe. The exhibition is a short history lesson. I discover that in the 15th century, at the time of Spanish Ferdinand and Isabella, and even before the memorable year 1492, the Ottoman Sultan welcomed the Jews from Spain and from other European regions , including Germany, France and others, to his empire. Jews were allowed to practice all professions and to own land. He wrote something like that about Ferdinand: “They say that he is a wise king. But what wisdom is it to expel these riches from his land and to allow us to enrich ourselves”. It moves me. I need to ask David if he knows this history. The neighborhood around the synagogue is all hills, very steep. The buildings are solid, “old Europe” in style. This must have been quite a prosperous area, attractive in its great vistas of the waters below ( only from certain points because these are mostly alleys), then obviously fell into a decline, and we see many signs of gentrification. By noon we enter the park of the Topkapi palace, which is free and open to the public. The signs point us in the wrong direction, and we end up walking for 40 minutes before we find the correct gate to the palace grounds. A guy jewelry peddler tells us that all day long he tells tourists that the sign is wrong, for years already, but the museum director does not do anything about it. First, tickets to the palace, then separate tickets to the Harem. The place is really like from the 1001 nights: the harem, the throne room, the four courtyards, the treasury, the view on Bosporus and Marmara Sea. Not as beautiful as Alhambra, which was built to be a perfection of heavenly beauty created on earth. Topkapi was the seat of the most powerful monarch on earth at some point. They were more interested in the earthly business than in re-creating the Heaven. Strategically, for an emperor this must be the best piece of real estate in Europe and Asia. I can appreciate Constantine’s decision to move his capital from Rome to Byzantium. And the climate is much better as well. Also, these seven hills must have reminded him of Rome. We estimate that there must be about half a ton of pure gold in these treasures, not counting the precious stones. Quite a treasure chest for the Turkish government. The day is getting hot. At around 4 PM we kind of collapse, among other exhausted tourists, in a café on a terrace overlooking Bosporus. Stay here for half an hour, resting, but this is not enough rest for me. Back in the hotel we park ourselves in the swimming pool. I stay longer than restless Philip, shower for a long time, blow dry my hair and exercise. Feel restored. Dinner at the rooftop restaurant of the hotel. Pricy and good. This is our last night in Istanbul. The view from the terrace is spectacular: the mosques, other roof top restaurants, the masses of people. I am already accustomed to the schedule of the prayers in this city. 5:15 PM, 8:45, 10:45. I could not fall asleep last night until around 2 PM. Sharing a hotel room and an unfamiliar bed is not easy; Philip is a very light sleeper, so when I cannot sleep and keep changing positions he wakes up, which gets me more agitated and prevents me even more from falling asleep. In this room the solution is the bathtub, which is deep and long. I put these enormous two pillow they gave us in the bathtub, one to sit on and one to lean on, and I am very comfortable reading that way. But I do not get enough sleep on this trip. We get up at 4:30 in the morning to catch the 7 AM flight to Izmir. That means that I got 2.5 hours of sleep. At this time of the day the roads are empty and the taxi goes very fast. We take in, again, this 18 million people city. The domestic flights airport is a modern and very efficiently functioning affair. It is a pleasant surprise, as I expected otherwise. The trip is uneventful, except for me feeling a bit like a zombie. In Izmir the luggage arrives very fast, and in no time we figure out where to take a shuttle but to the city center. So far on these trip Turkish cities seems well organized and smoothly functioning. A very short taxi ride from the city center stop. Park hotel is pleasant and small, with very friendly people at the desk. The room is very small, the bed also, the air-conditioning works flawlessly. A short nap for me while Philip figures things out. Then a walk in the neighborhood. Izmir is a 5 million people Mediterranean city. The water edge is a crescent shaped harbor framed by hills all around. The density of human dwellings on the hills is tremendous. It is very hot, impossible to walk in the sun. The sidewalks of the main streets are boiling. This hot and crowded city is my worst touristy nightmare come true. We need to get out of here. But the alleys are a different story altogether. Full of commerce, conversation, and hanging round. We encounter very few tourists in this city. People look the same way as in Istanbul, with perhaps more men hanging around cafes doing nothing in particular. As in Istanbul, there are not blacks, or Asians, or Turkic faces of the Central Asian ancestry. We check out the waterfront promenade (lovely), then go to the bazaar. Another magic place. We have chai. While resting at the chai shop, three men sitting across from us pull out musical instruments: violin, drum and a flat harp-like string instrument. The men play a tourist repertoire: Mesame muchio, Havannagilla, and Turkish tunes, but it feels like they are playing just for us. We give them change. This bazaar feels as large as in Istanbul and more authentic, as they carry relatively little touristy merchandise. One distinguishing feature are wedding gown shops. I count more than a dozen of them. We buy a lamp for 40 liras. With its predominantly golden colors it is different from others. Machine made, nothing especially artistic, a souvenir form Turkey to hang in Wellfleet for the family to enjoy. We keep walking, we watch people play backgammon on the low tables for serving chai: old people and young. Men are sitting and talking. What else can one do in this heat? Canopies are strung across the alleys for shade, and shopkeepers pour water on hot sidewalks. We walk, we sit, we watch, we have a drink, walk again, and time passes by. Philip buys an icecream cone form a street vendor. There is a boy with him, maybe 10 years old. The boy hands Philip the cone and states the price in English. I say to the boy: “You speak good English” which delights the father, who then hands me, for free, another ice cream cone. At some point we encounter some kind of public event: cameras directed at about 20 men in official attire sitting on a long bench in the bazaar. No sooner do I say to Philip that they look like Dutch burghers in a Rembrandt painting that the man in the middle stands up and extends his arms toward us: “welcome to my city, I am the mayor of Izmir.” A short exchange of pleasantries follow, we tell him what a great city it is, his English is not bad, he invites us to share coffee with him, which we politely decline, tells us about the history of this bazaar. Cameras almost touching my face. This is his great photo op for the mayor, we are having fun, a crowd gathers around us. We are probably on the local evening TV news tonight. Dinner on the waterfront, facing straight toward the sunset. The waterfront is a large semicircle, many kilometers long, forming a harbor. Hills on both sides hug the harbor, covered with dense housing, up and up to the top of the hills. We did too much today. Infrastructure in this western part of Turkey is superior: good roads, well run airports and bus stations, good bus connections. Impressive. I like many things about their food: the bread, rolls, pretzels and pastries, the tomato-and cucumber salads with every meal, the eggplant dishes, the fresh fish fried to crispiness. And that leafy green thing that tastes like watercress with a bite of a radish. Several of the eating joints we frequent display potted basil plants on the tables. Their basil has tiny little leaves, no more than an eight of an inch in diameter, but the flavor and scent are the same. This is a cherry and apricot season: a pound of cherries costs about 40 cents on the street. Philip can’t get enough of them. Overall, the variety of food in the simple restaurants is narrow. The same dishes of kebabs, meat balls, etc. A little greasy but not too much, and tasty. I am not crazy about their meats. I must be eating close to a pound of tomatoes every day, and a lot of cucumbers. The alley around the corner from the hotel has its own daily story. Men seem to live here by the day and well into the evening. Mostly older, but also younger men. They do not work. TVs sets are mounted high up, like in a sport bar, the men watch TV, play cards and backgammon, sit tea, and above all talk. They are here in the morning when we pass, and at 7 PM when we come back, this time they are watching the news (Libya). Today’s activity is a visit to Pergamum. We buy the bus tickets in a little office around the corner and a free shuttle takes us to the main bus station. The station is very far from here, close to the highway. It is huge, looking more like a small airport. The bus we expected for the 1.5 hour ride turns out to be a minibus for 15 passengers. The air-conditioning is barely functioning, it is 34 degrees centigrade inside. This is what we sometimes get when we go native. It takes more than half an hour to leave the city behind. The hills on both sides of the road are completely filled with low residential buildings, one to three stories high. From the distance we see not a patch of greenery, only cement and brick. It must be awful to live in these neighborhoods in this heat. And the grayish soup of pollution (from diesels?) hangs over the hills. These is what the megacities of the world are like. What does it do to human spirit to live in them? After maybe 30 minutes the density of human settlements on the hills subsides and we can see some earth between houses. No trees, just scorched earth. Over time, the density decreases even more and now the scorched naked hills dominate the distant landscape. Then the suburban landscape begins. A lot of construction is underway here, pretty awful modern structures poured out of concrete, with no trees in-between. As soon as we arrive at the Pergamum bus station, far outside the city center, a taxi driver offers his services to take us to the city center, and to all the sites, with no time limit, just paying him for the distance. It seems like a decent deal until I notice that the meter is going at some crazy speed. God knows how much this will cost. So we order him to stop and we negotiate a fixed price for the day of driving and his time 85 liras (later I realize that this was high). And for his good English. In Izmir and its environs not too many people speak English. The site seeing is a dream come true for me. Since I first became fascinated in the 10th grade with Ancient Greece and Rome I can’t seem to get enough of seeing these artifacts. We visit the Acropolis, with its very steep amphitheater chiseled into the hillside, and the P…. This latter is an interesting story: a hospital and psychiatric clinic. Water, sleep, baths, muds, talk psychotherapy and interpretation of dreams were central curatives here. In modern times the water was discovered to be mildly radioactive (probably radon), which validates the perceived curative impacts of drinking it. It probably killed bacteria, induced a hermetic response, and improved complexion. Roman emperors clamored to come here. The heat is intense. I am thankful for the strong breeze and for good shoes. Going back is full of unexpected complications. The schedule of buses to Izmir is not what we were told, and the earliest Metro bus is full. So we buy a ticket from another carrier. There are no markings, nobody speaks a word of English, and we almost miss our minibus when it finally comes. The air-conditioning works this time but our seats are way in the back, as part of the four seat bench. A tall thin man on my left, looking like a laborer, is clearly overwhelmed with the closeness of our bodies on these narrow seats. Our thighs are touching. He is sitting stiffly the whole time, looking straight ahead, tense. Half way through the trip he gets off and another man gets on. This one takes one look at the narrow seat next to me and decides to stand. But the attendant tells him to sit down, so the poor man sits on the very edge of the seat the entire time, barely supporting his weight, probably counting minutes until the end. Back at the Izmir bus station we realize that this bus company does not provide a shuttle back to our neighborhood in the center (which we should have known from the guidebook). Tax across town is the only way home. Well, we tried going native and using public transit and it does not work for us. Today we figured out the rest of the trip around Izmir: we will keep the car we rented for tomorrow for three days. It will be not only more convenient and comfortable but also cheaper that taking public transportation and taxis. We have gone native once, we do not need to do it again. Philip finds us hotels for the next two nights, makes reservations, and we notify our hotel in Izmir that we will check out for two nights. Getting out of Izmir is no simple matter. The traffic is, well, as expected. We prepare ourselves meticulously with an itinerary, but within the first few minutes Philip makes an error and we end up on the wrong highway. That is the worst case scenario. For the next half hour we are caught up in an industrial zone in a maze of roads and street that take us into unknown directions. A mess. This could take two hours to resolve. The map is not detailed enough to be of any use. But Philip has two great assets: his intuition about the geography of a place, and the sun to direct us in the general direction. At some point we stop at a gas station, and a helpful man with no English skills manages to convey to us that if we bear right for some unknown number of meters we shall come upon a sign for Ankara. Follow it, he presumably says. We eventually find that sign and as we wait in a line of cars to enter the highway Philip rolls down a window and asks a man in a truck if this is the way to Ankara. The man lights up, nods, and gives us a lengthy explanation, in Turkish, about something. Philip nods, OK, OK, I get it, then we roll up our windows and burst out laughing. This is so typical in our experience with Turkish people. As the traffic starts moving, the man is still waving his arm to ask in a universal sign “follow us”. This is indeed a road to Ankara, not the highway we were aiming for but we can find it on t he map, and it will take us in the right direction. The pollution is horrendous here. Probably mostly from diesel fumes. My chest and sinuses tighten, I have a slight headache. The road (as it will turn out the entire trip) winds through a wide valley, with hills and mountains on both sides. In the bowl and under this fierce blazing sun the pollution just thickens. The hills are just vague outlines behind the haze. For the first hour or so outside the city we pass major industry: ceramics, plastics, cement, others. At some point the entire side of a hill is being eaten up by some earth consuming machinery; we presume that this is all part of the cement production to feed the construction industry, to feed the gargantuan appetite of housing by these millions of people. Where is it all going? And the cloud of pollution over the valley does not budge. The road is good. Hardly any cars on it. Easy driving. We pass many gasoline stations and recognize many different petroleum companies, not like in the US. The price of gasoline here is about $10-12 per gallon. We in the US are insane. We eventually enter a lush agricultural area: orchards, vineyards, vegetables, grains. The grains are already harvested in some areas, only a golden stubble covers the earth. We ponder the water situation here: on the on hand there must be some plentiful source to produce this harvest, on the other hand we pass several dry river beds. We stop for lunch at a small town of Sarigol. It is about one and the sun is blinding. This heat is only manageable because of its dryness. We have lunch in a small local luncheonette, along with everybody else. A large woman in a turban-like head kerchief stands behind the counter and offers essentially five dishes to choose from: one is the familiar looking rolls of meat in a sauce, the other three look like liquidy stews. We do not know what they are, so we say yes to her suggestions. We end up with a large meal, too many dishes, somewhat greasy, and very tasty. As always, it comes with a tomato-cucumber salad, unlimited bread and free bottled water. My eyes meet those of the cook, I nod, she nods back with a smile. We have said what needed to be said: the food is good, thank you; you are welcome, I am glad that you like it, come again. Back in the car, cool, we enter a very arid area. The hills are sparsely vegetated, we see sandy soil, like dunes. It must be well over 100 degrees out there. At 2 Pm we arrive in Pamukkale. Our Hotel is a small family run affair (mother, son and very pregnant daughter in law, and another young woman), looks like an American motel with a place to park, a small swimming pool and a clean tiny room with the bare essentials. Friendly people, offer us tea. We are in a small village. They keep sheep and chickens in the house next door, and I smell the pungent odor of manure. This village could be totally self-sufficient in water and energy: has unlimited water (streams run along the streets in open canals), all houses have roof solar water heaters, all they need are photovoltaic installations. And the valley around produces vegetables, cotton and grains. The springs have medicinal properties and are warm (body temperature). Calcium travertines are the claim to fame in Pamukkale and one of the UNESCO world heritage sights. This is really an amazing natural phenomenon. A blazingly white mountain cover made of calcium carbonate, with textures looking, in turn, like frozen waterfalls, snow, cake frosting, small frozen beach waves, lace, frozen bubbles. All is white, and all is continuously washed over with sheets of running water. There is water everywhere. We climb this mountain barefoot, along with many other tourists, speaking all kinds of languages (Russian is dominating). The surface is not slippery and smooth enough. I love walking barefoot so for me this is haven, this walk in cool water, up and up. It takes quite an effort to make it to the top in this heat. We did not, stupidly, bring water with us, so I drink from the naturally made little waterfalls, wandering what large doses of minerals I am consuming. At the top of the mountain we find a board with chemical composition of the water listed: 500 mg of Ca, high concentration of magnesium, iron, sulfates and hydro carbonates. We wonder about the chemistry of this whole phenomenon. The top of the mountain offers resort like pool area where the stream emerges from the ground (34 – 36 degrees centigrade), and the ruins of the Roman city of Heropolis. The ancient Romans built curative baths here. We linger at the resort until it closes at 7 PM, pay a very short visit to the amphitheater of Heropolis from the 3rd-4rth century A.D., then walk back down. The walk down in this light is delightful. The long shadows give the travertines and the sheets of water a texture of unbelievable beauty. It looks like light is running down the stones. I will not try to describe it here. Tired. Light dinner on the roof terrace of the restaurant. Next to the pool, in lounge chairs, we have an argument about the balance between doing and being on our trip, figure things out, fall into a deep sleep. We linger this morning around the pool, swim, catch up on the journal, until 11:30. Quite a lot of driving today, about four hours. We take a longer way around from Pamukkele to Selcuk in order to see the famous ruins of Aphrodisias, which turns out to be even longer than we expected; a winding road through mountains, then driving through the Anatolian’s countryside. Richly cultivated, lush, prosperous looking. Undulating hills are quite picturesque. Houses are not fancy but they all look quite roomy: square structures with red tiled roofs, and a mosque in every town. It is nice to see this countryside. We would not see if we took the highway. Turkey is clearly getting ready for economic growth: everywhere we go the road is either fairly new and multilane, or is in the process of being widened. They are building for the future because at present there are hardly any cars on these roads. We arrive at Aphrodisias at about 1:30 at the hottest time of the day, and looking at the size of the area we decide to skip it at keep driving. At some point we come across of hillsides made of that same calcium carbonate as in Pamukkale, minus the hot springs. This material is mined here. Looking at the deep cuts into the hillsides we can see that the topsoil over this earth is just an inch or two thick. It is quite amazing that trees grow on it so abundantly. Another town, another city, and finally we make it to Selcuk. Kalehan hotel where we stay is an oasis of peace in this busy town. Two low buildings and a swimming pool amongst a rose garden, flowering trees and vines. Once we enter we know that this is our destination for the rest of the day. We swim, eat, have drinks, leisure around. Tomorrow we need an early start for Ephesus. We get an early start today to avoid the heat. Ephesus is a couple of kilometers from the center where we are. We are sorry to leave this lovely hotel; it would be nice to linger around the pool for a couple of hours this morning. At 8 Am the parking lot at the site is empty, which is surprising as, according to the guide book, we should see dozen of tourist busses unloading their human cargo. The mystery resolves itself soon enough when we discover that the main entrance is elsewhere, and that we have in fact entered at the end of what is considered to be the proper order. It takes us a while to realize that, and we initially try to follow the map in the reverse order, surprised that things do not make sense, and that there is nothing special about these ruins. Sometimes we can be pretty dense. I will not say much about Ephesus as an archeological attraction, except that it is really spectacular. We are walking through a real Greek-Roman city, with its entire urban plan intact: the street layout, the neighborhoods, the civic, commercial and private spaces the same as they were when the Greeks first designed this city. It is really a very special place. The famous library building is better than the photographs. Our guidebook does not say a lot about the live in Ephesus, but it is easy to fill in the blanks by listening to guides passing buy. I see numerous American families of 4-5 with private guides, and when they stop I stop, and listen. Some of the most interesting things I learn are these: Their water supply system was very sophisticated, including step-wise filtration of water coming from the hills above, using, first, gravel and then sand. I remember reading in the Western history of public health sand filtration was first introduced in Boston in the 19th century, and it reduced the epidemics of enteric diseases such as cholera much more than water chlorination which followed a few decades later. The Romans practiced it two thousand year earlier. It is quite remarkable to think of the immense amount of knowledge in technology that got lost with the fall of the Roman Empire, and in some cases had to wait one and half millennium to be reinvented during and well after the Middle ages. Another thing I learn is about the consumption patterns of the wealthy citizens of Ephesus. The richest of them lived in the section of the city that was off to horse drawn carriages. When the city population became very large the city fathers built a narrow gate leading from what the civic section (offices) – which was preceded by a residential section for regular citizens – to the cultural city center where the most beautiful temples, private residences, the library, the hospital and the small burial area for the most influential citizens were located. The effect was that the best part of the city was quiet and free of dust and horse manure. This is where the rich lived in their houses on terraces cut into the hill. And this is where upscale shops lined the main street, the sidewalk (yes, there was a sidewalk) being an intricate mosaic. Some of these private residences were very large, the biggest having 10,000 square feet, just like the MacMansions of today’s Newton and Silicon Valley. These mansions had bathrooms on each floor with hot and cold water, and private bedrooms for each kid. It is remarkable if you think that in modern Europe indoor plumbing was introduced for the first time sometime in 18 or 19th century, even in great palaces. So, the rich of then and the rich of now behave exactly the same way: they build Mac Mansions. Nothing has changed. Masses of people are moving through this city-site, and small groups lead by guides. I sit of a minute on some ancient stump of a column and listed to the multitude of languages: I cannot even tell how many. It is fun though to eves drop on a Polish and Russian guides, and for Philip, German guides. Relatively few Dutch are here, which we interpret as Turkey being already a has-been on the Dutch tourist agenda. We also pass a Chinese group which has a guide and a translator: the guide talks in English and the translator converts it into Chinese. In a few years there will surely be Chinese speaking guides in Turkey. Almost as interesting as the ruins are the people here. At some point we come across a hilarious group of Americans who seem to be straight from a Felllini’s movie or from the set of Dallas. There are maybe ten of them, mostly young women, with immaculate makeup, artificial breasts, and blown dried long tresses of hair, and dressed for a garden party in the Hamptons. The woman most standing out is probably in her 50s, completely made over by plastic surgeries, and is accompanied by a man in his thirties. There is also a youth among them, maybe 20 years old, dragging himself along but also keeping a distance, probably wondering what the hell he is doing here with them. He is probably a son of the older woman. The most hilarious thing about them is that each structure they encounter is a new photo op. So every few steps they arrange themselves in an artistic group pose, the women arrange the folds of their dresses and the flow of their hair, and the body builder guide takes a picture, ending each session with the same statement every time: “OK, guys, you look great”. This is just the beginning of their tour, and I would love to see them at the other end of town, after two hours of doing it in this sweltering heat and under this blazing sun. But we cannot follow them because they move too slowly and because by now we are at the end of our tour (moving in the opposite direction as we are). These people are so hilarious. They probably arrived on some luxury cruise boat. After the ruins we also visit the museum, where most of the sculptures form the site are kept. By 1 Pm we are pretty much finished. Lunch at an outdoor café under a tree. It is hot. We get into a conversation with the owner, who also runs a carpet shop next door. He tells us about his rug business in the US, which he keeps by going once a year to the US and showing his rugs at private gatherings in private homes, like Tupperware parties. I ask him to teach me something about good carpet and not so good carpet, which he does in his shop while Philip sips coffee outside. Of course, the lesson becomes in short order an attempt to sell me a small rug. I actually have my eye on a beautiful rug, which he offers for $400 (I could get it for less, I am sure), but I resist the temptation. Moreover, he says something that reveals that he is misrepresenting the truth: he says that this small rug (maybe 3 by 5) sells in American shops for $3000. That is nonsense. Even if this is the real thing I could get it at Gregorian’s for about a thousand or perhaps a bit more. By now we are really wiped out. We get in the car and head for the nearest beach, which takes about half an hour of driving along picturesque winding hillside road. The beech is a balm for our bodies and souls. We rent two lounge chairs, bathroom privileges and an umbrella, and over the next few hours we are in heaven. The Mediterranean water is cool, the waves are high, the air is cool under the umbrella. This is the best way to end this trip. Drive back to Izmir takes only about an hour, then another half an hour through the city traffic. We do not have a proper map of the city, and this is a real miracle that Philip finds (after numerous trials and errors) the way back to the car rental place. By 8:30 we are check into the hotel and have dinner in an outdoor café across the street. The evening in the city is not too hot, the men in the alley around the corner are in their usual places, one group watching a movie and another watching some TV serial. Tomorrow will be a slow day before traveling back to Amsterdam. We linger the whole morning in the hotel, writing, reading, checking e-mail. We are tired and also ready to go home. This city is hot. In the afternoon a walk through the bazaar. Dinner at the waterfront. Walk back to the hotel. A complicated journey home. First a limousine service to the Izmir airport for the 8:30 AM flight to Istanbul. No traffic on this Sunday morning. The driver is a young man with an easy smile who sometimes works at the front desk of our hotel. About ten minutes into the trip he suddenly makes a U-tern and tells us that he needs to pick up a friend who is also going to the airport. Two minutes, he says. We do not like it but cannot stop him. It takes ten minutes, and the friend turns out to be a long haired, long necked tall beauty. Well, there was no stopping this guy. Smooth one hour flight to Istanbul. Pick up the luggage. When we made these travel arrangements we did not realize that we would use two different airports, extremely far apart from each other. Taxi to the other airport takes 40 minutes at about 140 km/hr speed, and costs 150 liras. We have a chance to see Istanbul one more time from the bridge over Bosporus. It looks familiar this time; we recognize buildings and other landmarks. We get to the airport in plenty of time to spend the rest of our money on a meal and a bottle of Raki, the licorice-tasting local spirit. Uneventful flight back to Amsterdam. Everything went right on this trip., and we will soon forget the tiredness of doing it all. I look forward to quiet life in Voorschoten and then in Wellfleet.